I breed AKC only, healthy, good representatives of the breed. I have friends/handlers, Heather and Ivy Kimball of Hollyoak Chihuahuas that show some of my dogs (we have lots of ribbons!). My girls are happy mothers. If they didn't enjoy having babies, I wouldn't breed them. When one of my girls gets near a whelping date there is someone with them 24/7 so that they are not alone and so that we can be there in case any problems arise. This part of breeding is my least favorite. I am held captive until labor starts, the puppies are delivered, and everything is as it should be. My vet is only a phone call away! The Mama's and their litters are separated from the pack and have their own quiet space and available outside kennel run. I screen potential puppy owner's, and have a bring back policy so that none of the puppies born here are ever surrendered to a shelter. I could do nothing without the guidance and assistance of my Veterinarian! I trust her with the very lives of my precious babies and she has never let me down. She has seen me through countless emergencies as well as supervising my routine care. 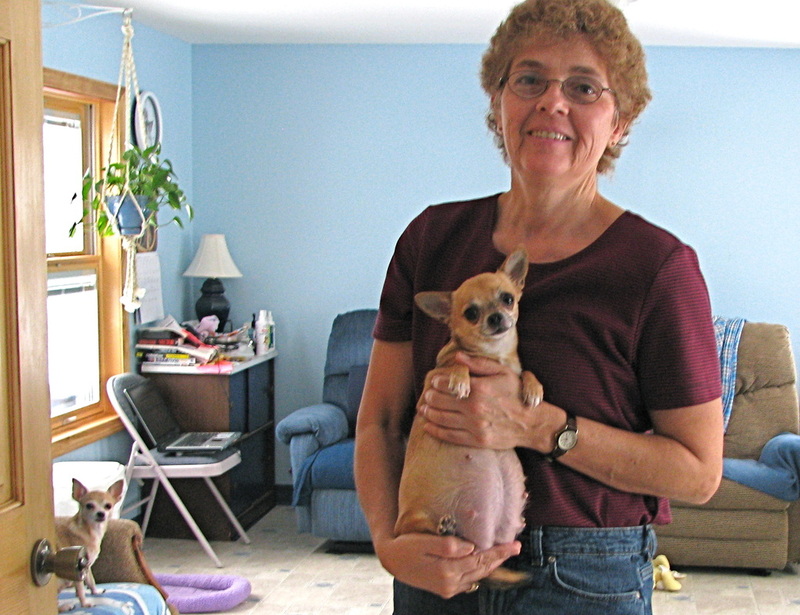 She is well knowledgeable in all things “Chihuahua” and can take care of anything that I run into. She has assisted me with birth, death and everything in between. Her expertise, compassion and fabulous staff make it a joy to work with her! I started breeding back in the day when "papers" meant little to the many puppy mills in Maine. Unscrupulous breeders registered their litters with anyone that would give them "papers". Many companies jumped on the opportunity to make money on these breeders (send them a photo of anything that looked remotely like a Chihuahua and they would issue "papers")... what a rip-off! Over the years I researched these companies and exposed some of them, with one "registry" threatening me with a letter from their lawyers. Over the years I tried to help some of the puppy mill owners to have more compassion towards their animals and educate them on flea and tick prevention. None were willing to invest the time and money to research and seek to produce quality puppies that were home raised, not cage raised. Over the years I have watched as authorities closed down most of the puppy mills in Maine. And over the years I did research to add only quality puppies and dogs (most from Champion lines) to my pack. 2014 saw the fruit of my labors as a couple of my dogs entered the AKC show ring and one female bred by me got her AKC Championship! That would be Miss YankeeBelle Shasta Daisy! My dogs get the best of everything. As my pets, they deserve it! I welcome visitors (and their cameras), but ask that visits be by appointment only, as I have a very busy life. As well as I've always got work to do around here and other outdoor chores to do as well. My life is very busy, but I like it that way! Smile!